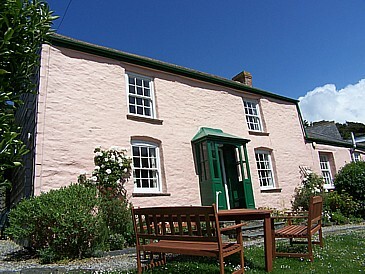 The Pink Cottage is situated just across the road from the beach at Port Gaverne. It has a wonderful view of the valley and is a short walk away from Port Isaac. Self Catering accommodation at Port Gaverne. pub and restaurant next door. The Pink Cottage is in an ideal situation from which to enjoy North Cornwall's magnificent scenery and local activities which include golf, walking the coastal path or inland wooded valleys, swimming, sailing, wind-surfing, water-skiing, mackerel fishing from Port Isaac, visiting the many National Trust houses and gardens, cycling along the 15mile Camel Trail and horse riding. The Pink Cottage self catering accommodation at Port Gaverne in North Cornwall.